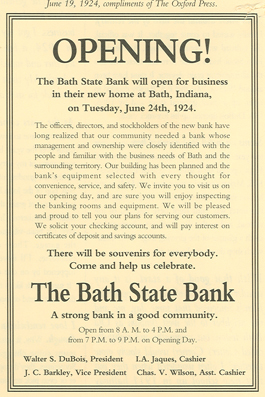 When the Bath State Bank opened in 1924, the intent was to provide financial products and services to the surrounding communities. With a $25,000 capital investment, our forefathers set forth with their mission. I sometimes wonder if they ever dreamed the Bank would grow to accumulate $16 million in Capital and $160 million in assets, with another $100 million in loans that we have originated and serviced throughout 30-plus counties in Indiana and Ohio. On January 1, 2019, I became the seventh President in the history of the Bank. As leadership has come and gone at Bath State Bank, one thing has remained constant over the past 95 years -- the desire to remain a locally owned, independent bank. Throughout the Great Depression and Great Recession, the number of banks selling out and merging was alarming for all small banks trying to make it in rural Indiana. With the constantly increasing demands from the government on compliance and cybersecurity costs, this has not been an easy storm to weather. Many consultants will tell you that Bath has not only been able to survive, but thrive over the past century, due to our commitment to Agricultural Lending. They say a small bank needs to have a niche to survive; however, I think it is more than just that. It’s the way our employees treat people that has made the difference. We believe face to face, honest communication is the way to do business. We believe it is our duty to help the person on the other end of the phone, in the lobby or with a dead battery in the parking lot. We also believe it is our responsibility to leave our community better than we found it. We are staunch supporters of the communities in which we live and serve, not only as an organization, but as individuals too. Our employees are involved in countless organizations to make our community a better place to work and live. Our Mission is to “Build genuine relationships with our customers and community by caring for them like family.” Typically, a financial institution's mission will say something about providing shareholders with an above average return on their investment… While this is necessary to stay in business, this is not our mission. A mission should be something that every employee strives to do when we walk in the door every morning. Ours is simple: be genuine and treat them as you would want to be treated; because it’s the right thing to do. When you treat people right, they will do business with you and the rest will take care of itself. At Bath State Bank, we have been helping make people’s dreams come true since 1924. If you have a dream, we would love to hear about it.